Andrew 'Willzy' Wills, Anatole Masfen and Dirk Kneulman won the North American Championships, hosted by the Bayview Yacht Club in Detroit, MI from September 4-8, 2012. After discarding a ninth place in the seventh and final race, NZL 1348 finished with 14 points overall - less than half the points of second-placed Argyle Campbell in USA 1375 (29 points overall). Officials from Michigan and Ohio are ramping up efforts to find out if any live Asian carp are in western Lake Erie â€“ and theyâ€™d like anglers to help out by providing any information they might turn up. Kites Over Lake Michigan: Wow! After a while, you run out of superlatives to describe the annual kite festival that turns Two Riversâ€™ Lake Michigan beach into a visual feast, with the air over the sand and water filled with kites of every color, size and description. All to the delight of thousands of attendees, who linger to watch the kites, catch a few late summer rays, and play in the cooling waters of the big lake. One night in August I unrolled a sleeping bag for the best four hours of sleep in recent memory. The sky was clear, the winds were light and the S.S. Badger, whose open upper deck has become a favorite accommodation, was gliding over the waves toward Ludington, Mich. I could tell by the stars overhead. Monday morning, coming back, I watched with a heavy heart as the Wisconsin shoreline came into view. I was thinking this was probably my last trip on the old ferryboat. 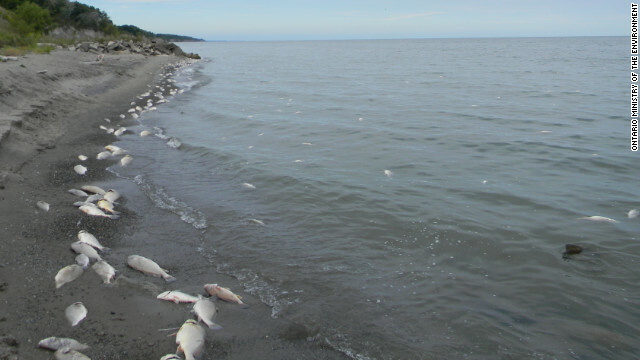 ens of thousands of dead fish have washed up on a 25-mile stretch of Lake Erie's northern shore, and Ontario environmental officials say they could be victims of a natural phenomenon called a lake inversion. etroit â€” Lakes Huron and Michigan this winter are likely to approach or set record low water levels, a new report predicts. By December, the two lakes are likely to be just above, at or just below record lows of 1964-65, according to the 6-month projections of the U.S. Army Corps of Engineers. "The entire Great Lakes basin received below average precipitation for the month of August," the report said. "Precipitation levels for the Superior and Ontario basins were especially low." â€œJaws,â€� the 1970s horror classic, lured record audiences into theaters and sent terrified beach buffs scurrying out of the water. Fortunately, freshwater rivers and lakes offered water-lovers a refuge from any menacing creatures lurking beneath the surface. Indiana has signed onto a multi-state plan to improve Lake Michigan's ecosystem by reducing the amount of Chinook salmon stocked in the lake. The plan calls for Indiana, Illinois, Michigan and Wisconsin to cut the number of salmon the four states release annually into the lake from 3.3 million to 1.7 million.